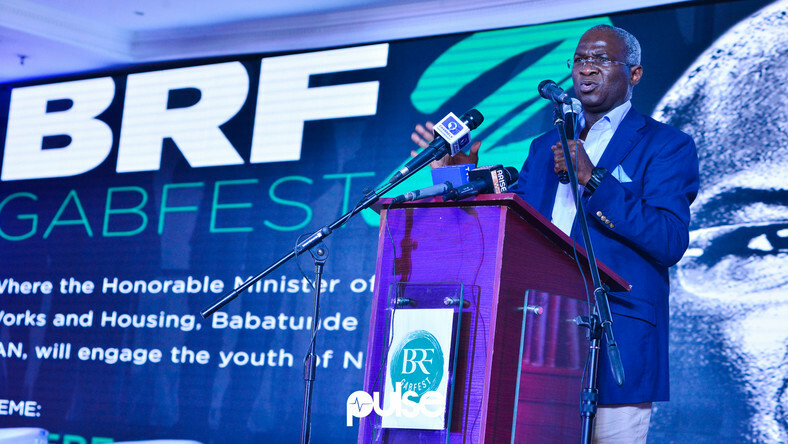 The Minister of Power Works and Housing, Babajide Fashola on Thursday in Lagos had a session with selected youths where he engaged them on the Muhammadu Buhari administration is creating jobs and revitalizing the various sectors of the nation’s economy. The venue was the iconic City Hall in Lagos and the hall was filled to capacity with young folks who were desirous to know the strides the government was making. Fashola argued that jobs are being unlocked in various massive infrastructure development of this government. According to him, more jobs are coming if Buhari gets re-elected. The minister said this during the BRF, Gabfest 2 with theme: ‘Where are the jobs’. He said that the Federal Government will need 192 million litres of petroleum product to complete the second Niger bridge. “This will in return create opportunity for several oil, logistics and other companies in the country. “President Mohammadu Buhari does not have time to write letters, but he understands the needs for infrastructures development, and he working along with other minister to achieve this. “People complains about the country’s economy, the truth is that, there is nothing wrong with Nigeria’s economy.” He also stated that the Federal Government will need 18 millions bags of cement for the Mambila Hydro project. This will also provide several opportunities for Nigerians. “Infrastructure is key to job creation in any country in the world, and this is what our government is dealing with. “No nation have ever produce jobs by proclamation,” Fashola added.